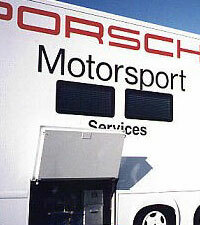 [gt3r] When you joined Porsche in spring of 1999 did you have any professional or personal goals? How did you come to be technical director? I guess you can say it has always been my goal to work in motor sports. When I was younger I was mainly interested in all types of motorcycle racing- mainly motocross and supercross. When I went to college I took all of the car design courses that they offered- internal combustion engine design, ground vehicle dynamics, etc. Then when I started working, my main focus was CAD design and composite fabrication, which just happened to fit nicely with the requirements for a position in a CART team here in Southern California. After working on the aerodynamic side of CART cars (bodywork and wings), I was still interested in motor sport and by luck I met with Alwin Springer who was looking for an engineer. I felt that Porsche offered me a chance to go in different career direction with engine R & D and after 5 years it is still exciting. It is another chapter in motorsports. I'm able to broaden my knowledge, always learning new technology, we (PMNA) are the first to get the technology, able to develop the components, and I'm able to see first hand the technology being used. [gt3r] What is it that you are interested in? I'm happiest with engine development, tuning, and working with new technology. My strong skills are in computers and as racecars are evolving, the dependence on computer controls is increasing everyday, which suits me nicely. [gt3r] Can you describe your capacity at Porsche? At the track, and the shop activities. My title is technical director, and its capacity is different at the track than it is at the shop. Here in the shop I'm in charge of the workshop and customer support for all of the customers with Porsche motorsport products. I'm also in charge of research and development for race engines here in the states, and work closely with the German engineers comparing results. We do some things on our own, but most of the new product development is done in Germany. There is also a tremendous amount of administration that goes with the job. At the track, my main task is support for the teams. Computer support, tech, and making sure engines run right for the teams to keep them going. Setting and making sure all the computer parameters are correct. Eric Bloss is also there for race support, He is more with mechanical knowledge, and know how, he's been involved with Porsche since the 962 days. David Glenn is our on site parts sales; he is currently working on a program to support the teams with chassis and shocks settings (with the help of Roland Kussmaul) to help with our on-track support program. We all work well together, and provide a good balance between each other. [gt3r] You are the primary contact for many of the teams in the US, as well as the European teams running in the US, what is it like? Is the burden hard to handle? I get all types of questions from teams, and techs working with the cars. Many times since everything is new including the technology in the car, I learn with them for the first time as well. Porsche can provide the best direction and resources to make sure they get the answers they need. I root for everyone, and since I'm involved with each team I know their challenges with what they are up against. It is a big part of the job. My job allows me to be able to see the big picture of everything going on. I really enjoy it. [gt3r] What kind of communication does Porsche Germany have with you guys? How does it work? There is pretty good communication. Everyday I talk to the German engineers. Many of the durability issues are dealt with in the US before they are seen in Europe. There are more teams and events in the North America and also rougher tracks, which puts a lot more stress and wear and tear on the components. Europe has the FIA, but more of the potential comes to us in the US to figure out and address the development of new parts and equipment. PMNA sends parts and data back to the lab in Germany to be checked, inspected, etc. All of the communication and experience gives us a broader knowledge base to draw conclusions from. [gt3r] Why no 996 GT2? Good question. The products we develop and promote are all dependent on the Porsche board of directors. The answers they choose are to help the best image of the company and although they all know that Porsche's roots are based in racing there are many other factors that have to be taken into consideration. Rumors about things abound, Cayenne projects, V-10 activities. I believe it when I see it. Several companies in Europe are trying to work on this issue on their own and I have heard power numbers around 650hp. People are doing it, but Porsche is not promoting. [gt3r] What is left to be squeezed out of the 996 GT3 R? There is no question we are reaching limits of a normally aspirated flat six engine. You look at all the theory and there is just not much more room for moving parts. We are working on subtle changes and minute massaging. Higher displacement is just not the answer. Stroking the engine brings up interference and clearance issues. Bigger pistons/cylinders compromises the cylinder thickness, making the 4.0- 4.2 liter engines less durable and leads to higher blow-by past the rings, etc. There has to be a complete re-design of the engine to make anymore reliable power. [gt3r] 2004 GT3 RSR what's new? What's in the pipeline for 2005? 2006? The RSR has all revised pick-up points and is a big step in correcting the handling problems of the early cars, especially when compared to pre-2002. The Newer Bodywork has been adapted, and obviously a new sequential gearbox. The production run has been completed of about 25 cars, and they have been sold out. The tally in the US, Peterson-1, J3-1, Flying Lizard-2, BAM-1, AJR-2, Racers Group-2, and one is in private hands. We have the ability to get spare chassis', engines, and any other spare parts as needed. There have been about 150 2004 GT3 Cup cars produced (used in Carrera Cup, SuperCup, and Club Cars around the world); about 35 are in the US. 2005 is planning to be a similar year to 2004, with a GT3 Cup, and a GT3 RSR. Both platforms are going to be in the similar vain. 2006 is still anybody's guess, we will all have to wait and see. All race related, and the focus is on the development of the GT3 Cup and GT3 R engines. We have spares in stock back to at least the 2000 model lines, older products are available, but we have to order them from Germany. Most of these parts are made in short runs, and we are able to go back to the original manufacture and have limited runs made when needed. We also continue to do standard engine rebuilds on 962, 935, 993 RSR, 993 GT2 and GT1's. [gt3r] What is passed onto streetcar development? I'm sure there is information that is passed on, but what exactly I'm not sure. We don't have a direct line with Porsche streetcar engineers. [gt3r] Porsche has had on occasion been given flak on teams not being allowed to have the engine software access. What is the policy and why? Porsche provides engine rebuilds and customer support at the main events that the products are used in. If customers change the programming and an engine blows an hour after a rebuild, we are held liable. There have been instances where this has happened and the programming had been modified, and changed back. It keeps those honest, it is what it is, and things can't be changed by anyone other than us. Some people think there are gains to be made by mapping changes, but you just can't get more out of what's there reliably, just too much of a chance to screw things up. There is less of a need to have customers tuning engines; with the sophisticated closed loop controls of the latest Bosch systems, they are set at the optimum parameters already.